This one made me a little happy, then a little angry, then a little happy again. A little happy, because it's pleasant enough to look at. I mean, it's not my favorite or anything, and I wouldn't call it pretty, but it's fine. And then a little bit angry, because it was tagged "Paph lehmanii." That plant doesn't seem to exist, though there is a Pescatoria lehmannii. 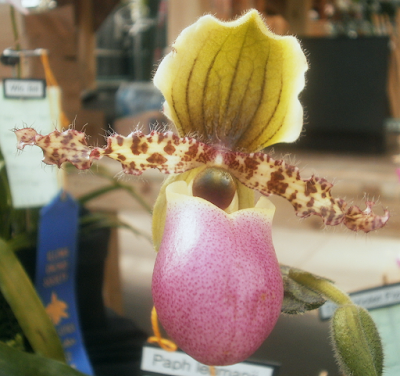 Which looks nothing like a Paphiopedilum, of course. (Though Pescatoria lehmannii is remarkably pretty; check it out.) Somehow or another, I managed to locate some photos of Paphiopedilum liemianum, which match up, so that's my guess for the ID here. But then happy again, because I realized that it looked a lot like a NOID orchid from the 2012 show, so if I'm correct about the ID for this plant, then I've also probably identified that one. And it always feels good to resolve a long-standing problem like that, even one that's completely inconsequential. The whole experience averages out, emotionally, to mildly-annoyed-but-I'll-get-over-it-shortly. That Pescatoria is gorgeous. I do like a good purple flower. The kitten is very cute, too. Anthurium no. 0512 "Landon Sky"
Anthurium no. 0366 "Maureen Biologist"